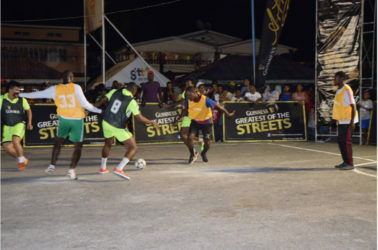 Defending champions Amelia’s Ward Russians, Team Magics, Wisroc, Silver Bullets and Retrieve Unknowns clinched places in the round of 16 of the Guinness of the Streets in Linden. 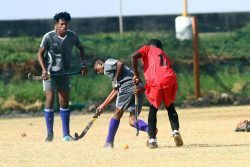 Played Friday night at the Mackenzie Market Tarmac, Amelia’s Ward Russians edged Ripping Bullets 1-0 with Terrence Aaron netting in the 14th minute. Meanwhile, Magics downed Attackers 3-1. Joel McKinnon gave Magics the lead in the second minute, intercepting a pass before dribbling the final defender and finishing into the right corner from the left side. Avengers levelled the score three minutes later as Reyon Venture scored into the left hand corner. However, Magics regained the lead in the seventh minute as McKinnon scored his second, slotting home into the left corner, after collecting a right side pass following a two on one situation. Kester Randolph sealed the outcome in the 17th minute with a simple finish down the centre from the right side of the field. 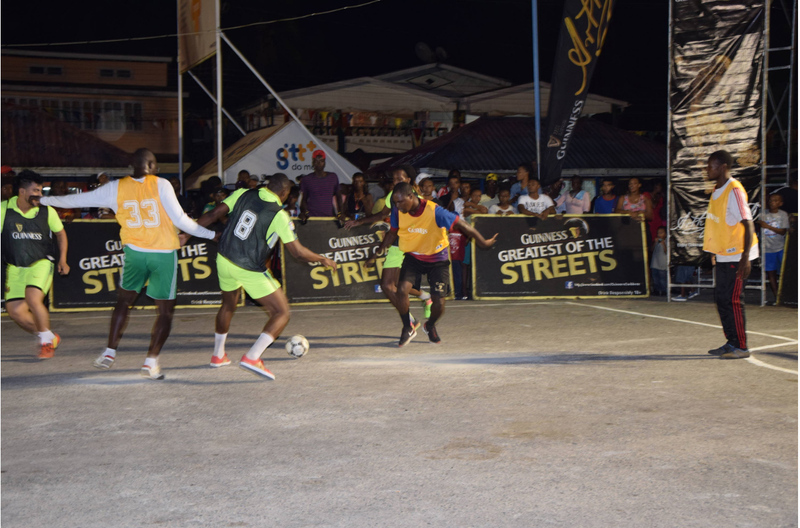 Action between Team Magics and Attackers in the Guinness of the Streets Linden edition at the Mackenzie Market Tarmac Friday. On the other hand, Wisroc edged High Life Crew 1-0. Mark McLean separated the teams with a fourth minute strike, stabbing his effort into the centre of the net. Also, Silver Bullets riddled South Stars 4-0. Robin Adams recorded a hat-trick in the 10th, 12th and 19th minutes while Rawle Gittens scored the fastest goal in the event in 24 seconds. Meanwhile, Retrieve Unknowns crushed Goal Getters 3-0. Carlon Mc Almont, Akeem Singh and Shaquille Alexander scored in the fifth, seventh and 18th minutes respectively. In other results, FC Deportes brushed aside Rough and Rugged 5-0. Trevon Phillips recorded a double in the third and 13th minutes while Jason Swaving, Sherlock Phillips and Roger Houston scored in the 16th, 17th and 19th minutes correspondingly. A Randy Small double in the fourth and 13th minutes propelled Hard-Knocks to a 3-1 win over Avengers. Assisting with a fifth minute conversion was Trenton Lashley. On target in the loss was Earl Samuels in the 12th minute. In another encounter, Team 25 blunted Cutting Clear 5-1. 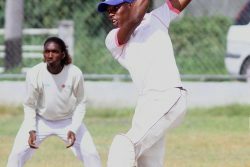 Ryan Gravesande scored a double fifth and seventh minutes, while Collie Hercules, Kwesi Johnson and Kennard Simon scored in the sixth, 13th and 17th minutes respectively. Action in the event is set to continue tomorrow at the same venue.